The persons and events in this film are fictitious - fortunately! A masterpiece of off-the-wall comedy, Airplane! 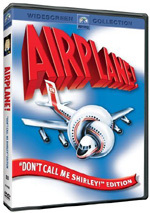 features Robert Hays as an ex-fighter pilot forced to take over the controls of an airliner when the flight crew succumbs to food poisoning; Julie Hagerty as his girlfriend / stewardess / co-pilot; and a cast of all-stars including Robert Stack, Lloyd Bridges, Peter Graves, Leslie Nielsen, Kareem Abdul-Jabbar ... and more. Their hilarious high jinks spoof airplane disaster flicks, religious zealots, television commercials, romantic love ... the list whirls by in rapid succession. And the story races from one moment of zany fun to the next. When Airplane! 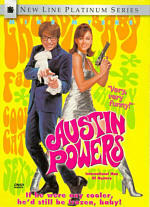 hit movie screens in 1980, I was 13 and should have been a prime target to see the film. Its kind of madcap humor seems perfect for someone in that age group, and the picture certainly did enough business to warrant my attention. However, although I wanted to see Airplane!, I didn't. My failure in this regard happened for reasons I don't recall, but I'll blame my Dad - why not? Eventually I did watch Airplane! when I went to a party in 1982. A friend had the movie on tape and we took in a screening at that time. I was excited about this, since I'd heard so much about what a great film it was. However, I didn't agree. As I recall, I thought Airplane! might have offered a laugh or two, but even to my moronic 15-year-old self, I couldn't find much humor in it. Who knows, maybe the gags went over my head. That seemed unlikely, since so much of the comedy in Airplane! appeared sophomoric; I was a sophomore in high school at the time, so it should have been a perfect fit. Nonetheless, I didn't like it, and with one exception - the brilliant Ruthless People from 1986 - nothing done by Abrahams and/or the Zucker boys has entertained me. Despite that weak track record, I figured I should give Airplane! another shot. Alas, the decades between showings has not altered my opinion one iota. I still think it's a pretty lame little movie. Airplane! functions as a very broad spoof of all the disaster films that were so popular back in the Seventies. Although the Airport movies of the Seventies connected to it in title and theme, it used 1957’s Zero Hour as its main inspiration. By the end of the Seventies, the entire disaster genre has largely run its course, but it remained active enough in the public's mind to inspire the spoofing we witness in Airplane!. Whether or not this was a good thing is debatable. Does much of my disaffection for Airplane! have to do with personal taste? Yup. I won't deny that Zucker/Abrahams/Zucker seem to do what they do fairly well, a concept that was reinforced when I watched the film's sequel. As much as I dislike the original, the follow-up made Airplane! look brilliant and inventive. I also won't deny that occasionally the team hit upon something moderately funny. Within Airplane!, I found myself amused by the ill woman who generated a bunch of eggs from her mouth, just like in the magic tricks; it wasn't a great gag, but for some reason it worked for me. I found a couple of additional mildly witty bits as well, but there's nothing in the film I can say seemed hilarious or particularly memorable. In any case, I honestly don't understand the appeal of Airplane! or films like it. The humor they purport to offer seems so haphazard and insanely broad; I get the feeling that the filmmakers try to win us over by sheer volume of gags rather than through any form of quality. Almost none of it strikes me as clever, or thought-out or inspired; it just seems dopey and pedestrian. Maybe it's a mistake for me to try to review movies like Airplane! since the film may have merits that escape me. Perhaps it's the same as assigning an opera buff to review a country album; the latter may be an excellent piece of work, but if the critic despises the genre, it's quite unlikely he'll be able to accurately assess the product. I don't think my situation is that extreme. After all, I do enjoy film comedies, and it's not as though I only go for allegedly intelligent products such as Woody Allen’s pictures. I like some movies that many consider stupid, such as things like Billy Madison. However, I see a spark of creativity in those films, whereas Airplane! just seemed asinine. Airplane! appears in an aspect ratio of approximately 1.85:1 on this single-sided, double-layered DVD; the image has been enhanced for 16X9 televisions. This was a consistently mediocre transfer with a number of problems. Sharpness usually seemed decent to good. Occasional shots came across as a bit tentative and soft, though, and I can’t say the image often looked razor sharp. However, it mostly maintained positive definition and didn’t cause too many distractions in that department. I noticed no issues with shimmering or jagged edges, and edge enhancement appeared to be absent. Print flaws were a bigger problem. The movie demonstrated moderately consistent examples of specks and grit along with some nicks, hairs and blotches. At times it offered decent cleanliness, but it became awfully messy on other occasions. Colors generally were fairly flat and without much life or vibrancy. They could seem somewhat runny at times, but generally they were acceptable other than their blandness. Black levels appeared reasonably deep and dark, but contrast was a little weak and shadow detail came across as excessively heavy much of the time. Overall, the image of Airplane looked very drab. Flawed but better was the Dolby Digital 5.1 soundtrack of Airplane. This remixed the movie's original monaural audio. Except for the music, the soundfield stayed pretty firmly anchored in the center channel. The score spread nicely across the forward spectrum and provided solid stereo sound, and the surrounds also reinforced the music in a light but appropriate manner. All dialogue seemed to come from the center, and the vast majority of the effects emanated from that channel as well. On a couple of occasions, I heard some effects pop up from the sides, and I even heard one or two times where split surrounds appeared, such as when the plane landed at the end. However, the soundfield remained modest and it worked well for the film. Audio quality seemed erratic. Dialogue displayed a fair amount of problems. At times speech sounded reasonably natural and distinct, but the lines often appeared edgy and harsh, with some concerns related to intelligibility. Effects displayed some similar concerns, as louder scenes could be somewhat rough or distorted. These problems didn't seem terribly substantial, though otherwise, the effects usually were flat and without much life. Music easily fared best throughout the soundtrack. The score usually appeared nicely bright and brassy, and its dynamic range was quite broad. Across the board, the movie’s music sounded lively and dynamic. That factor redeemed the rest of the audio to some degree, but too many flaws popped up for me to give this mix a grade above a “C+”. If you compare my picture and audio notes to what I wrote in my review of the original Airplane DVD, you’ll find no differences. That’s because I discerned no differences between the two discs. I thought this was a real disappointment, at least in regard to the visuals. I expect the audio was about as good as it could get given the film’s age and low-budget origins. However, I feel the picture could definitely be improved, especially when it came to all the source defects. Airplane didn’t look too hot in 2000, and the transfer hasn’t become more acceptable with age. That means the only change on hand here relates to extras, where the “Don’t Call Me Shirley” edition adds a few new components. From the old disc, we get an audio commentary from writers/directors Jim Abrahams, David Zucker and Jerry Zucker plus producer Jon Davison. All four sat together for this running, screen-specific chat. I largely found it to offer a very interesting and compelling discussion of the film. The commentary suffers from a surprising number of empty spots, and even when conversation occurs, the participants sometimes do little more than joke about how they have nothing to say. Despite those issues, much of the track provides a lot of really good facts and anecdotes about the movie. These guys aren't afraid to criticize the work and they also give us a fairly frank discussion of the reality behind their creation. We hear a lot about the studio politics that affected Airplane! and they go into their inspirations for the movie and quite a few other topics. Honestly, I enjoyed the commentary much more than I liked the film itself; the track was quite a lot of fun. The only other element found on the first disc also reappears here. 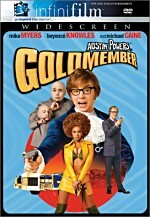 The movie's theatrical trailer gives away a lot of the film's gags, but considering the massive number of jokes packed into its 87 minutes, plenty more remain to be uncovered. As for new material, the major addition is referred to as the Long Haul version of Airplane. Some have gotten the impression that this presents an extended cut of the film, but that’s not the case. While it does offer a smattering of deleted scenes, instead it uses branching to give us a slew of interview clips related to the flick. In this case, “slew” means 60. If you activate the “Long Haul” version, the film will automatically branch off to show these snippets at the appropriate time. This makes it virtually impossible to actually watch the film. It rarely runs for more than a minute or so without interruption, so don’t attempt to screen Airplane with this feature active if you hope to enjoy the flick. The “Long Haul” feature does work well as a form of documentary, though, especially since we get to see the scenes connected to the material. None of the snippets are long; taken together, they fill a total of one hour, 10 minutes and 32 seconds. Those with a hankering for deleted scenes won’t find much, as we get only three short clips. The majority of the footage stems from the interviews. We hear from the Zuckers, Abrahams, Davison, special effects supervisor John Frazier, and actors David Leisure, Ross Harris, Nicholas Pryor, Lee Bryant, Robert Hays, Peter Graves, Leslie Nielsen, Lorna Patterson, Al White, Norman Alexander Gibbs, and Billy Koch. The pieces cover a broad mix of subjects. In addition to the cut footage, we learn about various effects, casting and working on the film, editing and pacing, goofs, playing the roles, the effect the film had on various careers, and general production notes. Some of this repeats what we learn in the commentary, but quite a lot of new material appears. The brevity of the clips makes them a little choppy, but there’s lots of great information here. Airplane fans should really dig this treasure trove of details. For more information of that sort, we head to the Trivia Track. This text pieces runs along with the movie and gives us actor credits as well as notes about goofs, flaws, references, effects, background elements and other general production topics. This is a true trivia track, as most of the information can really be described as “trivial”. But that doesn’t mean it’s not fun. Inevitably, we find comments that already appear in the commentary and/or the “Long Haul” version, but there’s still enough good stuff here to merit a look from fans. The DVD opens with a few ads. We get trailers for Tommy Boy, John Wayne films, Bad News Bears (2005) and Ferris Bueller’s Day Off. These also appear in the disc’s Previews area. Despite its status as a comedy classic, Airplane! did almost nothing for me. I find it to offer an unpleasantly stupid and uninteresting program from start to finish. The DVD provides rather bland picture plus erratic sound but adds a nice set of supplements. Fans of the film and the genre will likely love Airplane!, but if you're a doubter, pass on it; I don't think it'll generate many converts. This is definitely the DVD to buy if you don’t own the earlier release, but it’s questionable as an upgrade. That’s because this edition doesn’t improve picture or sound quality, so if that’s your main interest, it won’t be useful for you. However, it does include some good extras that didn’t appear on the prior release. Fans who want to learn more about the flick will want to get it to check out those elements.